As our customer base has grown so have our requirements for masking fixtures. And we have discovered, the fastest way to provide the highest level of service is to manufacture them internally. From this, our manufacturing abilities were born. Beginning with roll forming, we produced helical flighting for our customers to make into augers. Wanting to provide more value-added services, we began creating the auger assembly as a whole. That led us to creating a fully developed manufacturing facility where we now have the ability to produce small or large batch metal components. 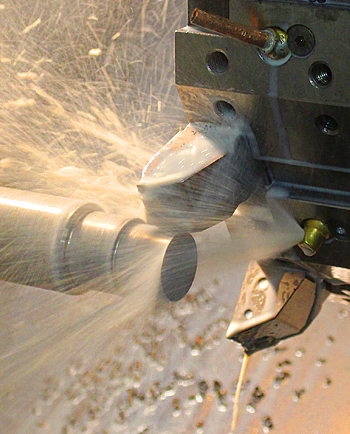 We utilize both conventional and CNC machining with feeder systems to efficiently produce either one-off items or mass quantities with repeatable quality. With the addition of our special processes and engineering services, we are able to provide customers complete products with enhanced wear surfaces and corrosion protection, all from one facility. This minimizes logistical efforts and prevents the issues that arise from using multiple vendors on single products. The result: decreased cost and production time, and an increase in supplier accountability and quality. 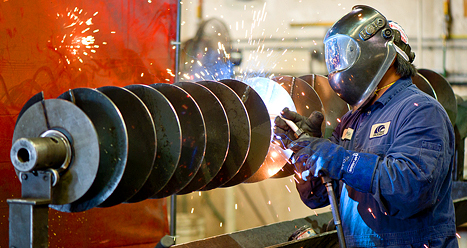 A welder attaches sectional flight to a precision auger after the tube section has been assembled. The only thing left is to complete dynamic balancing. Bar feed systems attached to many of our CNC Lathes allow lights out manufacturing of high volume components used to make our customers products. This process ensures these details are both of the highest quality and are manufactured in-house.